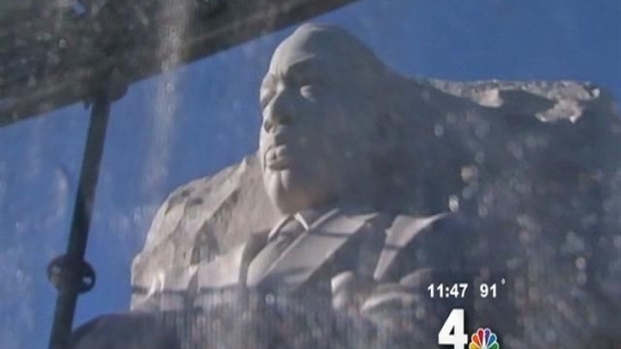 D.C. and Metro officials warned Tuesday of road closures and potential long walks for people who want to attend the Martin Luther King Jr. Memorial ceremonies a week from Sunday. “Take Metro,” said Metro general manager Richard Sarles. There won’t be any parking, shuttle bus service or other access near the Tidal Basin site, said Mayor Vincent Gray. When some reporters questioned the logistics, Gray noted that in 1963 -- King’s original march on Washington -- people gladly walked dozens of blocks. “March," like the civil rights warriors of old, Gray said, smiling. A few hundred thousand people are expected in Washington soon for the dedication of the Martin Luther King Jr. Memorial Aug. 28. More than a weeks worth of events will mean local residents will be adjusting to traffic and other changes. Despite the attempt at good humor, the city is facing another daunting mass event in downtown Washington. 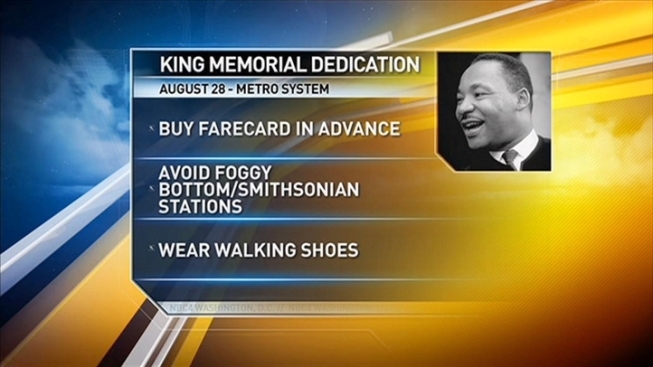 Metro officials encouraged visitors from Virginia to get off the subway at Arlington National Cemetery and walk over the Memorial Bridge. Sarles said the popular Smithsonian station on the Mall will be open, but he said Metro expects huge crowds there, which could delay service. Police Chief Cathy Lanier says she’s been coordinating with U.S. Park Police Chief Teresa Chambers on crowd control issues. But some emergency management plans are still not yet in place. Martin Luther King Jr. National Memorial Project President and CEO Harry Johnson with a preview of the Aug. 28 dedication. Complicating matters: President Obama is scheduled to speak at the memorial service Sunday morning, and former President Jimmy Carter may be present, too. The actual dedication of the King Memorial will be on the broad parkland adjacent to the site. A spill-over area nearby will include Jumbotrons for people to see and hear the ceremony. The King memorial site will open immediately after the ceremonies, but the crowds are expected to be intense. Here’s a little hint if you want to see the newest attraction on the National Mall: The site will have all of its construction mess gone by this Sunday. The shroud surrounding the King statue itself already has been removed. So drop by the site sometime this coming week and you’ll get a good view of the King Memorial -- without the ceremonial crowds. There was one big change announced by Gray today. Tuesday, Aug. 23 is being promoted as District Citizens Day at the memorial. The mayor had planned to pass out 100,000 tickets to local civic groups and organizations. But that task became too daunting. “Everybody was asking for tickets,” Gray said. Now, Tuesday is still District Citizens Day, but anyone who drops by the memorial will get to see it. For complete MLK Memorial coverage, visit our special section.